Celebrate the beginning of a new day in the quiet and stillness of the morning. The Centre's signature class is suitable for many. This Hatha class integrates the breath with an extensive variety of postures to increase strength and flexibility, bringing balance, while calming the mind. It's better than a double latte to start your morning! Wednesdays, 7:00 - 8:00 am, 8 weeks, March 27th - May 15th. Special rate for booking early - register with payment by March 20th, $155. After that, $170 (includes HST). Registration required. Surrounded by candlelight, linger peacefully in well-supported poses and relax into a sense of spaciousness and open-heartedness. Through breath work, mudras, mantra, movement and meditation we will focus on the heart centre while listening to a very special soundtrack. Feel free to bring along some cozy socks, your favourite blanket and eye pillow. You might choose to wear green (secondary colour is pink), the colour of the heart Chakra. Special treats for all who attend. Advance registration with payment required to reserve your "relaxation station". Special rate for booking early: register with payment by February 10th, $25, after that, $30 (includes HST). Thursday, February 14th, 6 - 7:15 pm. Celebrate the beginning of a new day in the quiet and stillness of the morning. The Centre's signature class is suitable for many. This Hatha class integrates the breath with an extensive variety of postures to increase strength and flexibility, bringing balance, while calming the mind. 7 - 8 am on Wednesday mornings. This session begins Wednesday, January 16th for 8 weeks, and runs until March 6th. All levels welcomed and encouraged. Special rate for booking early - register with payment by January 9th, $145. After that, $160 (includes HST). Registration required. Missed classes are not transferable or refundable. Relax, restore, rejuvenate and refresh. Happy New Year!!! Enjoy this gentle and luxurious entry into a new year of love, peace, joy, prosperity and laughter. Linger peacefully in gentle, supported postures which help to restore movement and flexibility to your body. The use of bolsters, blankets, straps and blocks bring you into a place of comfort and tranquility that encourages deep healing and release, allowing for complete surrender of body and mind. This deeply relaxing and soothing class held in candlelight with soft music, creating a peaceful atmosphere for your practice. It is suitable for beginners, people experiencing stress or anxiety and people who are recovering from illness or injury. It is also recommended to anyone, including advanced practitioners seeking a gentle, meditative class. There is a deep peace waiting for us, beneath our busy lives, under all of our tension, and beyond our fears. Restorative Yoga will help you tame your mind and expand your heart to find your deep peace, one breath at a time. Please bring along a small towel or facecloth to use with props if you are wearing makeup, lotions etc. Feel free to bring along some cozy socks, your favourite blanket and eye pillow. All levels of practitioners are encouraged and welcomed. 2:00 - 4:00 pm. Special rate for booking early: Register with payment by December 20th $35, after that $40 (includes HST). This all levels yoga class is set to rich rhythms and inspiring music and held by candlelight. With two classes to choose from this New Year's Eve - either 8:30 pm or 10:30 pm, this luxurious yoga class commences with meditation on our wonderful year and postures of strength and endurance to bring in the new year revitalized. Rejuvenated and refreshed after savasana, we are reborn and ready to take on a new year of peace, joy, love and success. Early Yoga Class: 8:30 pm - 10:00 pm. Midnight Yoga Class: 10:30 pm - 12:05 am. Special rate for booking early: Register with payment by December 20th $30, after that $35 (includes HST). Advanced registration required with payment. No drop-ins. Fee includes HST. Please register early to get your preferred time slot as these classes always sell out quickly. It's fun. It's furry. It's festive. It's a fundraiser!!! The Big Stretch Yoga Centre and Bayview Leaside BIA present the Holiday Pooch Parade in support of The Toronto Humane Society. My rescue dog Rufus and I will be leading the parade of pooches and their families along our beloved Bayview Leaside strip on Saturday, December 22nd at 9:30 am. Register for the parade or come along and watch. Each registered dog's family will receive a Loot Bag and prizes will be awarded for the most festively dressed dogs AND owners, smallest dog, largest dog, etc. courtesy of the local merchants of The Bayview Leaside BIA. You must register EACH dog that wishes to participate - unfortunately, you will not be able to turn up on the day without pre-registering. Registration is required - $10 per dog. All monies go directly to The Toronto Humane Society. Donations over $20 will receive a charitable tax receipt. If you often find yourself feeling more stress and less joy as we come into this busy time of year, join Joanne for 5 consecutive early morning yoga classes to ease into the holidays with comfort and joy. The Sadhana experience provides a greater understanding of the routine and the rewards of a daily yoga practice. Salute the Sun each morning with a flowing series of postures and breathwork that will refresh and rebalance the inner you, rejuvenate and strengthen the outer you. Monday, December 10th until Friday, December 14th. 6:45 - 7:45 am. Special rate for booking early: Register with payment by December 3rd, $90, after that $100 (includes HST). Pre-registration is required to reserve your space. Suitable for all levels of practitioners. Missed classes are non-refundable and are not transferable. We are pleased to announce our upcoming HOLIDAY POP-UP MARKET, right here at The Big Stretch, and hope that you can join us during this festive time of year. One afternoon only, Sunday, December 9th, 2 - 6 pm. Most of what we are offering in our shop is handmade, eco-friendly, sustainable or vintage - terrariums, greeting cards, jewellery, accessories, art, textiles, vintage denim etc. Featured artists and vendors include: Greets and Giggles, Simply Suzette, Tania Love, Room Art Concept and more... Over the next couple of weeks we will be teasing you on our social media pages with a sneak peek at our artists and vendors, their bios, offerings and photos. 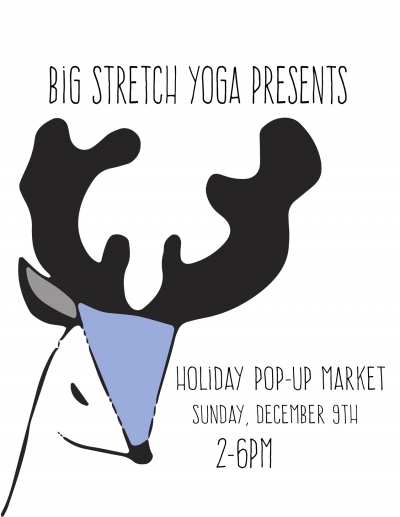 Big Stretch Yoga will be offering 10% off all yoga products (mats, props, aromatherapies) and 10% off drop-in yoga class packages at the event. In the spirit of the season and karma yoga, for our 20th year now, we will also be accepting your kind donations of new, unwrapped toys to support The Toronto Fire Fighters Toy Drive and non-perishable food for The Daily Bread Food Bank. Breathe if you love shopping! Join us during this full moon for a calm and cozy practice of connecting to spirit through breath, gentle flowing movement, and deeply relaxing restorative postures. Our class will conclude with a meditation practice. Feel free to bring along some cozy socks, your favourite blanket and eye pillow. Please bring along a small towel or facecloth to use with props if you are wearing makeup, lotions etc. No experience necessary. All levels are welcome and encouraged. Thursday, November 22nd, 7:00 - 8:30 pm. Special rate for booking early: register with payment by November 15th, $25. After that, $30. (Fees include HST). Registration is required to book your "relaxation station". Celebrate the beginning of a new day in the quiet and stillness of the morning. The Centre's signature class is suitable for many. This Hatha yoga class integrates the breath with an extensive variety of postures to increase strength and flexibility, bringing balance, while calming the mind. Leave the class feeling refreshed and ready for your day. It's better than a double latte to start your morning! Wednesdays, 7:00 - 8:00 am, 8 weeks, September 26th until November 14tth. Special rate for early booking - register with payment by September 19th, $140. After that, $155. Registration required. Missed classes are not refundable or transferable. 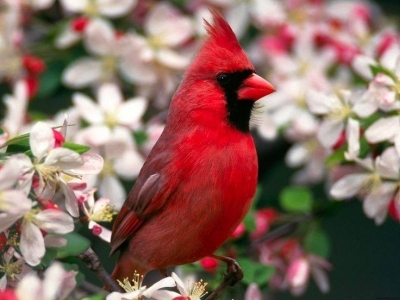 Cultivate a flexible body, a deep breath, a calm manner and an unfurrowed brow. Get up early, watch the sun rise, listen to the birds sing, shuffle amongst the autumn leaves and join us for a lovely series of classes to open your heart, expand your awareness and lift your spirit. Join Joanne for 7 consecutive early morning yoga classes - salute the Sun each morning with a flowing series of postures and breathwork that will refresh and rebalance the inner you, rejuvenate and strengthen the outer you. Monday, September 17th until Sunday, September 23rd, 6:45 - 7:45 am. Special rate for booking early - register with payment by September 11th, $120. After that, $135 (includes HST). Pre-registration is required to reserve your space. Suitable for all levels of practitioners. Missed classes are non-refundable and are not transferable. Join Joanne for 4 consecutive early morning yoga classes - salute the Sun each morning with a flowing series of postures and breathwork that will refresh and rebalance the inner you, rejuvenate and strengthen the outer you. Monday, August 13th until Friday, August 16th, 6:45 - 7:45 am. Special rate for booking early - register with payment by August 7th, $70. After that, $80 (includes HST). Pre-registration with payment is required to reserve your space. Suitable for all levels of practitioners. Missed classes are non-refundable and are not transferable. 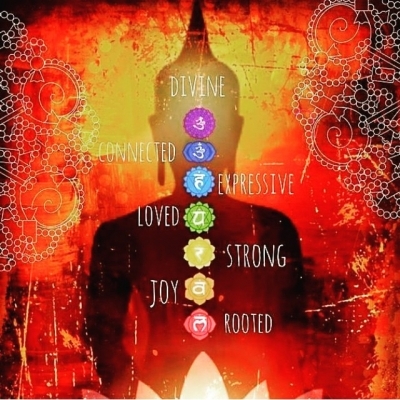 Chakras are subtle energy centres located in our body along the length of our spine. Each chakra corresponds to different physical, emotional, intellectual and spiritual aspects of our self. Yin Yoga is a slow, deep practice that increases your flexibility by stretching and stimulating the connective tissues of the hips, pelvis and lower spine. Yin is a deeply relaxing and rejuvenating form of yoga where the poses are held longer allowing for gentle surrender and a deep inner listening. As we move through this practice surrounded by the soft glow of candlelight, you will learn the Chakras physical location, organs they control, emotions they express, and mental characteristics they embody. Our class, lead by instructor Joanne Lowe, will be accompanied by music specifically created to energize and clear the body and spirit and balance the Chakra energy system. All levels are welcomed and encouraged. Thursday, July 19th, 7:00 - 8:30 pm. Special rate for booking early: register with payment by July 12th, $25. After that, $30 (includes HST). Registration is required. 7 consecutive days to a revitalized and refreshed you! Cultivate a flexible body, a deep breath, a calm manner and an unfurrowed brow. Sadhana is a sanskrit term which means conscious spiritual practice or quest. This yoga practice, lead by certified instructor Joanne Lowe, is for 7 consecutive days, 6:45 - 7:45 am. Practice yoga the way it was meant to be practiced, on a daily basis. Salute the Sun each morning with a flowing series of postures and breathwork that will refresh and rebalance the inner you, rejuvenate and strengthen the outer you. 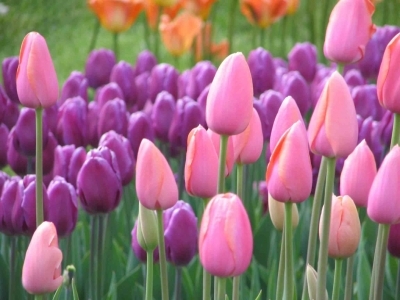 Get up early, watch the sun rise, listen to the birds sing, walk amongst the blossoming tulips and crocuses, and join us for a lovely series of classes to open your heart, expand your awareness and lift your spirit. Monday, April 9th until Sunday, April 15th, 6:45 - 7:45 am.Special rate for booking early - register with payment by April 3rd, $120. After that, $135 (includes HST). Pre-registration is required to reserve your space. Suitable for all levels of practitioners. Missed classes are non-refundable and are not transferable. Join us this Valentine's Day, Wednesday, February 14th, at our regularly scheduled drop-in yoga classes for a little extra lovey-doveyness - from our heart to yours. Linger peacefully in well-supported poses and/or (depending on which class you attend) enjoy flowing sequences and relax into a sense of spaciousness and open-heartedness. 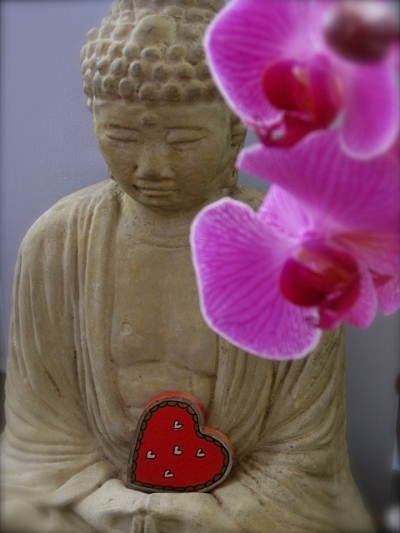 Through breathwork, mudras, movement and meditation, and a very special soundtrack, we will focus on the heart centre. You might choose to wear green (secondary colour is pink), the colour of the heart Chakra. Come alone or with your Valentine or buddy. Special treats for all who attend! Registration is NOT required for these regularly scheduled drop-in classes. Fee: $20 or utilize one of your pre-paid yoga classes. The Centre's signature class is suitable for many. This Hatha yoga class integrates the breath with an extensive variety of postures to increase strength and flexibility, bringing balance, while calming the mind. All of our classes are set to music. Wednesdays, 7:00 - 8:00 am, 7 weeks, January 17th until February 28th. $125. Registration required. 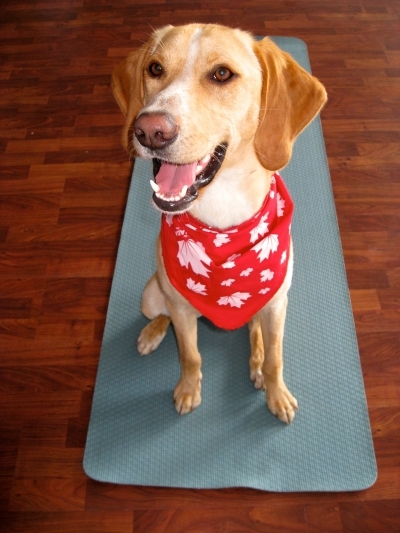 Join us over the holidays for our special charity Flow Yoga class to raise funds for The Toronto Humane Society. 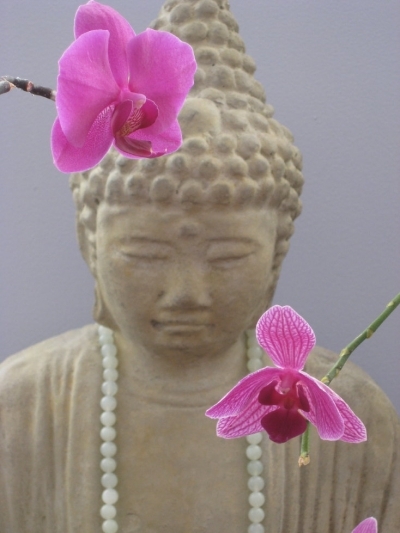 Suitable to all levels, enjoy this quiet, peaceful holiday practicing hatha and karma yoga. 10 - 11:30 am. Special rate for early booking: register with payment by December 21st, $25. After that, $30 (Includes HST) to drop-in. There are many causes of tension in the upper back, neck and shoulders including repetitive motion and strain, poor postural habits and stress. In this class, learn some simple ways to stretch and strengthen this area that can be done at home. Tight shoulders in downward dog and warrior poses? These techniques can also be applied to help you find comfort and ease in your existing yoga practice. This is a relaxing and restorative class. This class is appropriate for all levels of students. Beginners are welcome. 1:00 - 3:00 pm. Special rate for booking early: register with payment by November 4, $30. After that, $35. Registration is required (includes HST). This is a crunch-free class and suitable for students of all levels! When we think about core strength, we generally focus on strengthening our abdominal muscles. However, your true core runs from head to toe. The ability for your body to respond to the demands/requests placed on it, comes not from individual muscles, but from the effective communication and coordination of all the muscles, tissues, bones and nerves of your body. Through gentle and accessible movement, our focus in this class will be on making that connection and learning how it relates to your spine, the central axis of your body from which all movement originates. When we have a strong and flexible spine we can better support our whole body and move with greater ease. 1:00 - 3:00 pm. Special rate for booking early: register with payment by October 14th, $30. After that, $35. Includes HST. Registration is required. Explore the connection between music, movement and breath. Join us for an inspiring and rhythmic yoga class instructed by Joanne Lowe and accompanied by live music with musician Ben McCarroll-Butler. 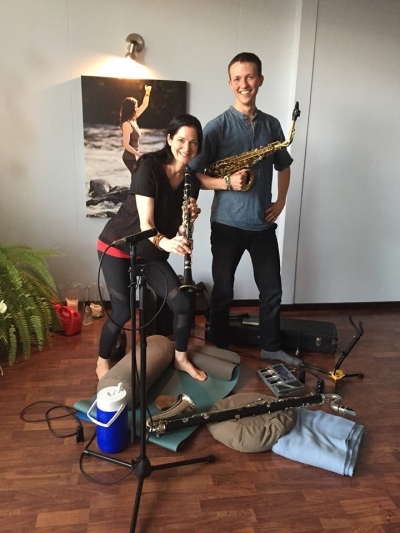 We are so happy that Ben, a fellow yogi and a multi-instrumentalist who specializes in woodwinds will join us and treat us to a lovely soundscape as we enjoy our practice. 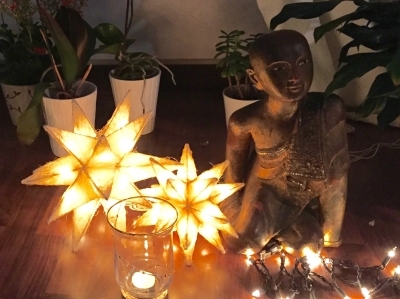 Surrounded in candlelight and accompanied by music, breathe deep and take time to reconnect, rejuvenate and revitalize in this flowing, hatha yoga class. All-levels are welcomed and encouraged. 7 - 8:30 pm on Thursday, October 19th. Special rate for booking early: Register with payment by October 11th, $25, after that $30 (includes HST). All-levels are welcomed and encouraged. 7 - 8 am on Wednesday mornings. This session begins Wednesday, September 20th, for 10 weeks, and runs until November 22nd. Special rate for booking early: register with payment by September 12th, $170, after that $185 (Includes HST). Registration required for this series. Clear your mind, breathe deep, stretch, relax, laugh, refresh. This September's BIG yoga retreat is located at Harmony Dawn Retreat Centre on 50 rolling acres of meadow and forests, which lead right down to Rice Lake, part of the picturesque Trent Waterway system. Harmony Dawn is an acclaimed, leading-edge Green retreat. It incorporates principles of Feng-shui and Yin-Yang balance, which includes its food -- a major draw for repeat guests. During this weekend you will either begin or deepen your practice of Yoga with asana, pranayama and meditation classes daily. Free time to swim in the lake, read, enjoy an old-fashioned bonfire, reconnect with nature on a hike or just lay back, relax and enjoy the views will complement this time of learning, healing, inspiration and rejuvenation. Bring along your bike or your running shoes if you'd like. Legendary vegetarian meals (spa cuisine) will be prepared for you by renowned and published Chef Nicola Lawrence James. Meals are prepared from herbs and vegetables from Harmony Dawn's gardens. This delightful weekend includes 6 fabulous meals, 5 yoga classes, a guided hike and meditation. Come alone or bring a friend. Beginners welcome and encouraged. Register early to avoid disappointment - space is limited. Friday, September 15th at 4:00 pm, until Sunday, September 17th at 4:00 pm. Special rate for booking early: register with payment by July 23rd, $395. + HST. After that, $445.00 + HST per person, shared occupancy. Payments accepted: cash, cheque, interac e-transfer to info@bigstretchyoga.com. If paying by Credit Card - please add $15. Contact Joanne for schedule, map and registration form. 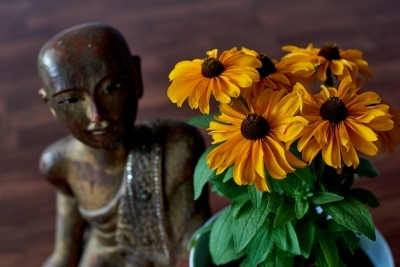 Deepen your practice by increasing your sensitivity and awareness. Movement and stillness, breath awareness and guided relaxation, will help you to ease into a fully embodied meditation practice. The classes will combine mindful movement (yoga postures), gentle breathing and deep relaxation practices, walking and seated meditation. If you have been wanting to try meditation but perhaps have felt intimidated by the thought of sitting without moving for long periods of time, this is a great way to begin a practice. 1:00 - 3:00 pm. Special rate for booking early: register with payment by May 21st, $30. After that, $35. Includes HST. Registration is required. Breathe deep, stretch, relax and rejuvenate. A great way to bond with your baby physically, emotionally and spiritually and get in some much needed stretching while baby plays or sleeps peacefully at your side. Bring along a baby blanket and their favourite toys. This class is suitable for newborn (when new mom feels comfortable being out and about) to approximately 1 year. Crawlers welcome! Pre-registration required for this four week series - Wednesdays,10:00 - 11:00 am, May 3 - 24th. Special rate for booking early: Register with payment by April 25th, $80, after that $90 (includes HST). Our session is open to moms, dads, aunties, grandmas, nannies etc. Babies get in free! You may drop-in to this class for $25 if there is space. Please call ahead to confirm if there is space. Breathe if you love babies!!! Join us for our tenth annual fundraiser for the WWF during Earth Hour - a candlelight yoga class instructed by Joanne Lowe and accompanied by live music with musician Ben McCarroll-Butler on Saturday, March 25th from 8:30 - 9:30 pm. 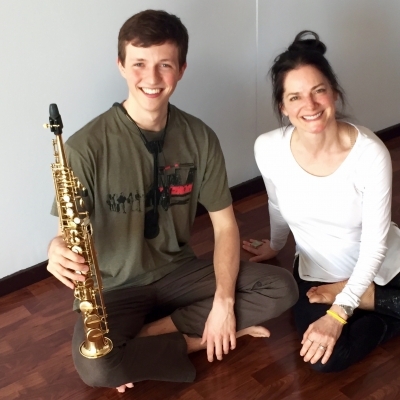 We are so happy that Ben, a fellow yogi and a multi-instrumentalist who specializes in woodwinds will join us and treat us to a lovely soundscape as we turn out the lights for Earth Hour and enjoy a peaceful, relaxing all-levels class. On Saturday, March 25th, 8:30 - 9:30 pm, cities across Canada, and around the world will turn off their lights for Earth Hour, a WWF event to raise awareness about climate change and symbolize that, working together the people of the world can make a difference in the fight against climate change. In support of Earth Hour and WWF, turn off your lights for an hour and/or join me at our candlelit yoga class. $20. Please reserve your space in advance with payment. 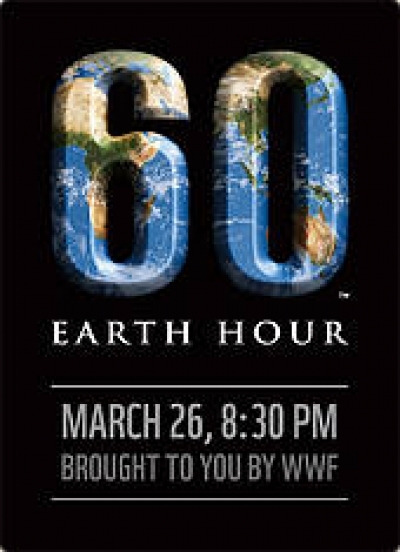 Check out www.earthhour.org for more information on this worldwide event. The WWF's mission is to stop the degradation of the planet's natural environment and to build a future in which humans live in harmony with nature. Breathe if you love tigers and polar bears!!!! Linger peacefully in gentle, supported postures which help to restore movement and flexibility to your body. Assisted by the use of props such as the wall, a bolster or folded blankets, poses are held for longer periods of time, allowing you to let go of long-held tensions that manifest both physically and mentally. This deeply relaxing and soothing class is held in candlelight with soft music, creating a peaceful atmosphere for your practice. It is suitable for beginners, people experiencing stress or anxiety and people who are recovering from illness or injury. It is also recommended to anyone, including advanced practitioners seeking a gentle, meditative class. Pre-registration WITH payment required. Missed classes are not transferable or refundable. Special rate for booking early: Register with payment by April 13th, $75, after that $85 (includes HST). You may drop-in to this class for $25 if there is space. Please call ahead to confirm. Take time for yourself and enjoy this gentle and luxurious class at this busy time of year. Linger peacefully in gentle, well-supported poses and relax while restoring movement and flexibility to your body. Assisted by the use of props such as the wall, a bolster or folded blankets, poses are held for longer periods of time, allowing you to let go of long-held tensions that manifest both physically and mentally. This deeply relaxing and soothing class is suitable for beginners, people experiencing stress or anxiety and people who are recovering from illness or injury. (You may want to check with your doctor first). It is also recommended to anyone, including advanced practitioners seeking a gentle, meditative class. Feel free to bring along some cozy socks, your favourite blanket and eye pillow. Advance registration with payment required to reserve your "relaxation station". Instructor: Joanne Lowe. 3:00 - 5:00 pm. Special rate for booking early: Register with payment by December 3rd, $35, after that $40 (includes HST). Yoga Nidra is a guided meditation intended to induce full body relaxation and a meditative state of consciousness. The class will begin with a gentle asana practice to release physical tension and help you to settle in for approximately 40 minutes of meditation. Done lying down, Yoga Nidra is an accessible meditation practice, suitable for beginners or more advanced practitioners. We'll use a variety of techniques such as body scanning, breathwork, sound and imagery to aid in deep relaxation. Yoga Nidra provides a much needed break for over-active, over-stimulated minds and can help to relieve restlessness, stress, anxiety and insomnia. 1:00 - 2:30 pm. Special rate for booking early: register with payment by November 5th, $25. After that, $30. Registration is required. Gentle, supported postures help to restore movement and flexibility to your body. Assisted by the use of props such as the wall, a bolster or folded blankets, poses are held for longer periods of time, allowing you to let go of long-held tensions that manifest both physically and mentally. This deeply relaxing and soothing class is suitable for beginners, people experiencing stress or anxiety and people who are recovering from illness or injury. (You may want to check with your doctor first). It is also recommended to anyone, including advanced practitioners seeking a gentle, meditative class. Special rate for booking early: Register with payment by October 25th, $75, after that $85 (includes HST). Pre-registration with payment required. You may drop-in to this class for $25 if there is space. Please call ahead to confirm. Learn some easy and effective ways to keep your feet, legs and hips strong, flexible and mobile. Develop greater ease of movement through improved mobility and stability, increasing your confidence in your yoga practice and other self-care routines such as running or walking. Appropriate for all levels. Beginners are welcome. 1:00 - 2:30 pm. Special rate for booking early: register with payment by September 23rd, $25. After that, $30. Registration is required. Shelly teaches hatha yoga in the tradition of Vanda Scaravelli. She strives to create an atmosphere of exploration and self-discovery in each class, where students can feel comfortable and at ease, no matter what level they are practicing at. 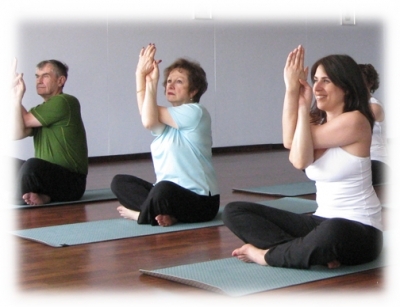 In her classes yoga is practiced mindfully, with attention to breath, grounding and alignment. The approach is therapeutic, with the objective being to restore balance; flexibility, agility and strength to the physical body, fullness and fluidity to the breath, and quiet to the mind. 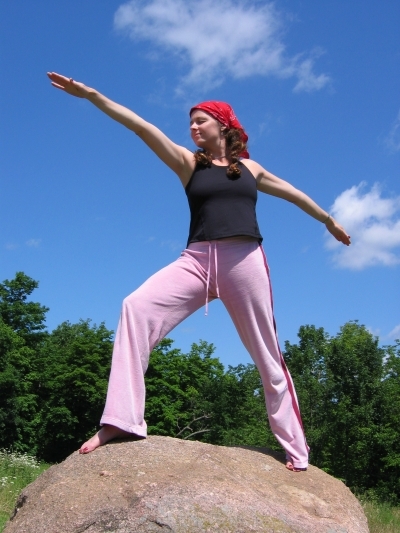 Shelly has experience teaching yoga to people of all ages and abilities. She specializes in teaching yoga to beginners, older individuals, restorative yoga, and yoga to relieve stress and anxiety. She is available to teach both private and group sessions. Wednesday nights, 4 weeks, 6:15 - 7:30 pm - $75/$85. Special rate for booking early: Register with payment by September 6th, $75, after that $85 (includes HST). You may drop-in to this class for $25 if there is space. Please call ahead to confirm. This deeply relaxing and soothing class is suitable for beginners, people experiencing stress or anxiety and people who are recovering from illness or injury. It is also recommended to anyone, including advanced practitioners seeking a gentle, meditative class. Feel free to bring along some cozy socks, your favourite blanket and eye pillow. Please bring along a small towel or facecloth to use with props if you are wearing makeup, lotions etc. Join us on Canada Day, for our special Canadian Flow Yoga class, suitable to all levels, and celebrate the birthday of our beautiful country. Wear red and white to show your spirit. Friday, July 1st, 10 - 11:15 am. Special rate for early booking - register with payment by June 26th, $20. After that, $25 (Includes HST) to register or drop-in. See you all then with glowing hearts, eh! Enjoy this earthy, grounding and relaxing practice inspired by the earth and our connection to it as well as ourselves and nature. Gentle, supported postures help to restore movement and flexibility to your body. Assisted by the use of props such as the wall, a bolster or folded blankets, poses are held for longer periods of time, allowing you to let go of long-held tensions that manifest both physically and mentally. This deeply relaxing and soothing class is suitable for anyone seeking a gentle, meditative class. Friday, April 22nd, 6:30 - 8:00 pm, $25 (includes HST). Explore the connection between music, movement and breath. Enjoy a gentle, relaxing restorative yoga class led by Joanne Lowe and accompanied by Nada Yogi Ram Vakkalanka's soothing Sitar. In Ram's hands, the musical notes become Mantras and create a vibrant, energetic and peaceful ambiance. During his 'Nada Yoga Meditation with Sitar' sessions, Ram uses the sacred Vibrations of ancient Ragas to clear energy blocks, balance the Chakras and induce inner healing. Two albums of his healing and meditation music have been released so far...'Sitar by the ocean' and 'Nada Kusuma'...both of which are used by many Yoga and meditation teachers during their sessions. 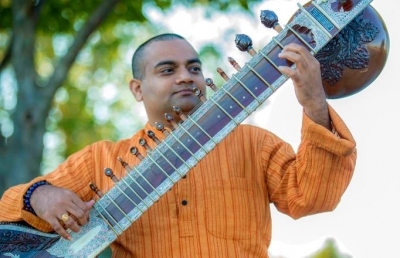 Ram conducts Nada Yoga healing and meditation music concerts throughout North America at Yoga studios and Retreat centers and presented Sitar music at many music festivals including the prestigious Stratford Summer Music Festival. To find out more about Ram or see sample videos of his concerts, please visit his website at www.aksharayoga.com. Pre-registration is required to reserve your space for this lovely evening. 7:00 - 8:30 pm, $35 (Includes HST). This class will combine mindful movement (yoga postures), breath awareness and guided relaxation, with standing, walking and seated meditation, helping you to ease into a fully embodied meditation practice. If you have been wanting to try meditation, but have perhaps felt intimidated by the thought of sitting without moving for long periods of time, this is a great way to begin a practice. Over the course of the class we will continue to build our awareness of body, breath and mind. And, over the three weeks, we will build up to meditating a little bit longer at the end of each class. Appropriate for all levels. Beginners are welcome. Friday nights for 3 weeks, 6:00 - 7:15 pm, $70 (includes HST). Wednesday nights, 2 weeks, June 17th and 24th, 6:00 - 7:30 pm - $45.00 (includes HST). Pre-registration with payment required. Instructor: Joanne Lowe. Wednesday nights, 4 weeks, 6:00 - 7:30 pm - $90. (includes HST). Pre-registration with payment required. Instructor: Joanne Lowe. There are many causes of tension in the upper back, neck and shoulders including repetitive motion and strain, poor postural habits and stress. Over 4 weeks we'll bring awareness to the conditions that may be contributing to pain and strain. 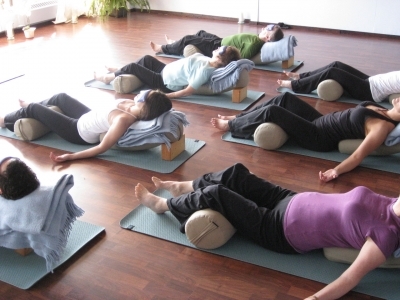 This class is semi-restorative, as a lot of it is deep relaxation to release tension. Students will learn simple ways to stretch and strengthen this area, that can be incorporated into a home practice. Friday nights, 4 weeks, 6:00 - 7:15 pm, $75 (includes HST). Pre-registration with payment is required to reserve your space. Shelly is the director and owner of Lila yoga and teaches hatha yoga in the tradition of Vanda Scaravelli. She strives to create an atmosphere of exploration and self-discovery in each class, where students can feel comfortable and at ease, no matter what level they are practicing at. A perfect class for a busy time of year!!! Wednesday nights, 2 weeks, December 3rd and 10th, 6:00 - 7:30 pm - $45.00 (includes HST). Wednesday nights, 4 weeks, 7:00 - 8:30 pm - $90. (includes HST). Pre-registration with payment required. Instructor: Joanne Lowe. Enjoy sun salutations, strengthening poses and sublime stretches in the first hour, followed by gentle, serenely supported restorative poses in the second hour. 1:30 - 3:30 pm, $35 (includes HST). Pre-registration with payment required to reserve your spot. Instructor: Joanne Lowe. Our recommendation: Come to the 10:00 am Big Stretch Yoga class, go out for a nice lunch or brunch and come back for "Strength & Serenity", thus creating your own little mini, urban yoga retreat. Perhaps a nice chai latte after? Restorative Yoga & Live Sitar Performance - SOLD OUT. Sunday, December 1st, 2:00 - 4:00 pm, $35 (includes HST). Pre-registration is required to reserve your space for this lovely afternoon. PLEASE NOTE: We have changed the date - originally was Sunday, November 24th. 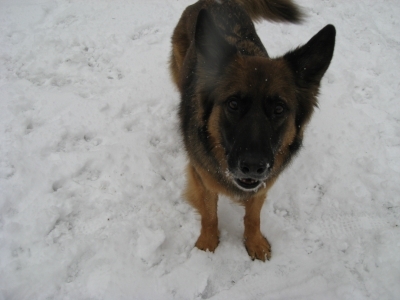 UPDATE: November 17th, thanks everyone, together, we raised $300 for WSPA Canada. Natural and man-made disasters wreak havoc on millions of people and their environment every year. Animals can be the forgotten victims, left behind, hungry and in pain. With dedicated disaster operations teams based in Asia and Latin America, WSPA is expert in alleviating disaster-related animal suffering. 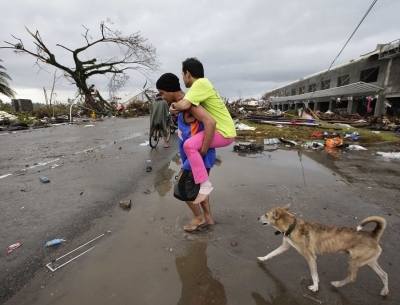 Helping animals disaster-struck animals not only reduces their distress, it helps whole communities. Many of the world's poorest people are totally reliant on animals for food, transport and their livelihoods; domestic animals provide valued companionship the world over. 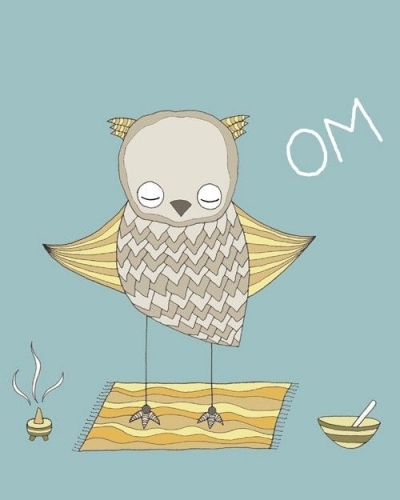 Yoga class - Sunday, November 17th, 3:00 - 4:15 pm. $20.00 cash. 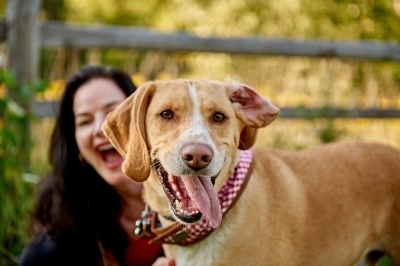 100% of class fees will be donated entirely to WSPA Canada. Please only RSVP if you are coming for sure as space is limited and we would like to raise as much money as we can. 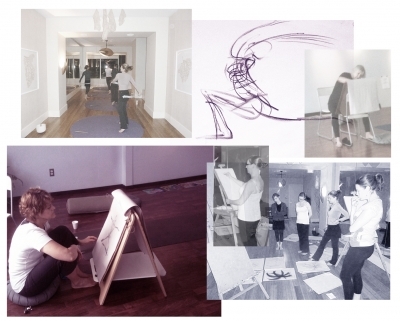 Join Tania Love, artist and certified yoga instructor in this workshop combining yoga and art. We will start with a sequence of breathing, gentle movement and meditation followed by figure drawing of yoga postures. 1:00 - 4:00 pm, $55 + HST. 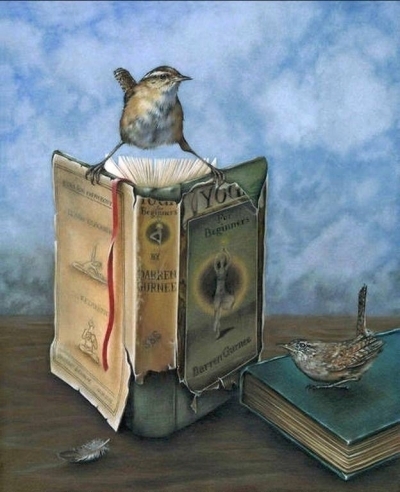 To learn more about Tania Love and her exhibits and artwork, check out her website at www.art.tanialove.com. SORRY, THIS SESSION IS SOLD OUT. Have you heard that yoga can be very helpful in reducing back pain? This series of classes is based on The Essential Low Back Program that was used in a National Institute of Health study in the U.S. In the study, published in the Annals of Internal Medicine, 78% of participants had significant reductions in their pain levels and showed continued improvement in their condition 26 weeks later. Join us as we spend six weeks strengthening and stretching the low back, building core strength and focusing on the key yogic principles of stability and ease. We'll discuss anatomy, bring awareness to posture and reflect on habits that can help and hinder our condition. As part of this course, please plan to do a gentle home practice and light reading that will support the work we do in class. Please contact the studio if you have concerns about whether or not this class is appropriate for you. Included in the price of this course: The Essential Low Back Program book (85 pages) and MP3 CD which contains five yoga practices. 6 weeks on Friday nights from 6:30 - 8:00 pm, November 1 - December 6th. Your investment is $195 (includes HST, book and cd ($40 value). Register early. This class is limited to 15 people. 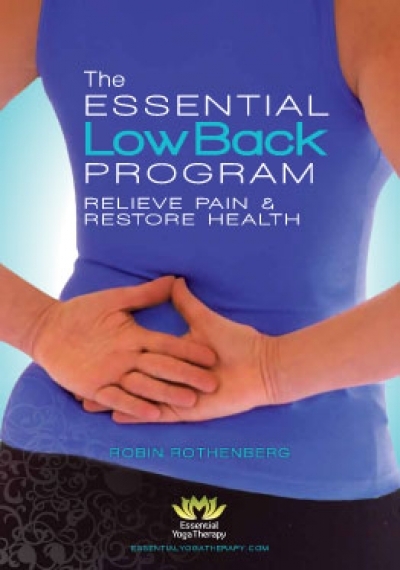 Melissa was trained by Robin Rothenberg, ERYT-500 and Professional Yoga Therapist in the protocol for Essential Low Back Program, and is qualified to present this series for therapeutic purposes. Our feet are one of the most important parts of our body. They connect our bodies to the earth, they take us to where we want to go, we use them all day long, and yet when it comes to caring for ourselves, it's often our feet that we neglect the most. Flat feet, weak ankles, plantar fasciitis, arthritis, bunions, hammertoes. These are all common foot ailments. We will discuss alignment and weight distribution and how these things affect the flow of energy through our knees, hips, back and shoulders. Learn how hatha yoga can help energize, relieve, sooth and renew your relationship with your very own feet. Discover the effects in the rest of your body-mind. This class includes a take home practice. Jill brings a love of yoga and over 24 years of practice and teaching experience to her classes. Her approach is influenced by the teachings of Esther Myers, Monica Voss, and by her ongoing studies with senior teachers at Esther Myers Yoga Studio. Based on the principles of grounding, breathing, and freeing the body, Jill believes yoga is adaptable and can meet everyone where they are at. Her classes aim to provide a playground for exploration and expression of natural movements intended to help balance, release and revitalize the mind/body/spirit. Jill has formal training in yin yoga, restorative yoga, pre/post-natal yoga, pre/post-rehabilitation, multiple sclerosis, brain injury, stroke, osteoarthritis, and other special needs. She is a certified Yoga Teacher (759 hrs), Yoga Exercise Specialist, Fitness Instructor Specialist, Older Adult Fitness Specialist. Jill has also helped develop advanced national certification, trained and certified fitness instructors and personal trainers to work with the 50+ population. Your summer yoga retreat is located at Harmony Dawn Retreat Centre on 50 rolling acres of meadow and forests, which lead right down to Rice Lake, part of the picturesque Trent Waterway system. During your retreat weekend you will either begin or deepen your practice of Yoga with asana, pranayama and meditation classes daily. 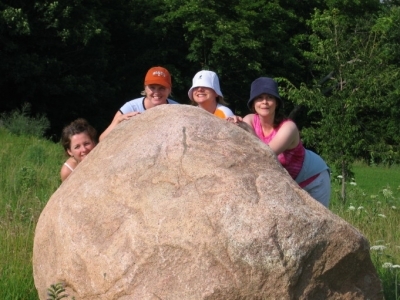 Free time to swim in the lake, read, enjoy an old-fashioned bonfire, reconnect with nature on a hike or just lay back, relax and enjoy the views will complement this time of learning, healing, inspiration and rejuvenation. Bring along your bike or your running shoes if you'd like. Legendary vegetarian meals (spa cuisine) will be prepared for you by renowned and published Chef Nicola Lawrence. Meals are prepared from herbs and vegetables from Harmony Dawn's gardens. Friday, August 2nd at 4:00 pm , until Sunday, August 4th at 4:00 pm. $400.00 + HST per person, shared occupancy. Includes 6 fabulous meals, 4 yoga classes, a deep relaxation class, a guided hike and meditation. Register early to avoid disappointment - space is limited. Early bird discount - Register with payment in full by May 15th, 2013 and pay only $400 - we'll pay the HST for you. That's a savings of $52.00! A great way to bond with your baby physically, emotionally and spiritually (or get in some much needed stretching while baby sleeps peacefully at your side). Suitable for newborn (when new mom feels comfortable being out and about) to approximately 10 months. Bring along your baby's blanket and any of their favourite toys. Pre-registration required for this four week series - Wednesdays in June - 10:00 - 11:00 am. $75 for moms or dads. Babies get in free! Breathe if you love babies!! Wednesday evenings, 4 weeks, beginning May 29th, 6:00 - 7:30 pm, $85.00. Come join us for another informative and playful two hour Yin yoga workshop exploring what the spring, the wood element and our Liver have in common and how we can use them in our yoga practice to positively affect our health and well being. This workshop will introduce you to Traditional Chinese Medicine (TCM) concepts that involve postures, breath work, massage techniques used to stimulate our Liver system which can be best supported during the spring months. About Yin Yoga: This is a slow, deep practice that increases your flexibility by stretching and stimulating the connective tissue of the hips and spine rather than the muscles. This quiet practice targets the deeper tissues of the body using gentle, steady and therapeutic stresses. This is a deeply relaxing and rejuvenating form of yoga where the poses are held longer. Yin Yoga is a great compliment to the more active Yang (Vinyasa) styles of yoga and is beneficial for any level of student including athletes. This quiet and contemplative yoga helps prepares the student for deeper meditation practice. This class will be lead by Cathy Keenan, Certified Acupuncture Practitioner and Yoga Instructor. 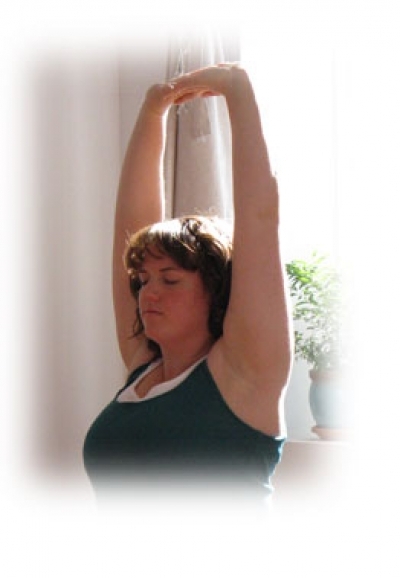 About Cathy Keenan: Cathy has been practicing and studying yoga for over 13 years. After completing her yoga teacher training in 2003, Cathy continued to seek out the teachings of many internationally respected practitioners. It wasn't until studying with Paul Grilley that she took a serious interest in learning more about acupuncture and Traditional Chinese Medicine (TCM). 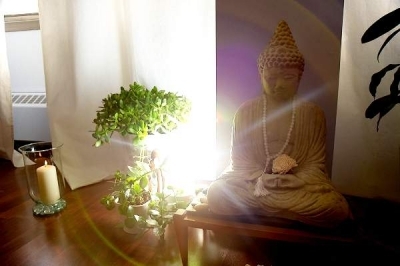 In pursuit of a deeper understanding of the mind/body connection and an interest in holistic therapies Cathy has completed over 2400hrs of study in acupuncture and TCM and continues to study with many inspiring practitioners. Pre-registration with payment required, $30 (includes HST). Sunday, April 14th - 1:00 - 3:00 pm. Next four week sessions begin April 3rd. Come join us for a cozy two hour Yin yoga workshop exploring what the winter, the water element and our Kidneys have in common and how we can use them in our yoga practice to positively affect our health and wellbeing. This workshop will introduce you to Traditional Chinese Medicine (TCM) concepts that involve postures, breath work, massage techniques used to stimulate our Kidney system which may need some extra tender loving care during the winter months. Pre-registration with payment required, $30 (includes HST). Sunday, January 27th - 1:00 - 3:00 pm. This workshop, instructed by Tania Love, will use the ground of gentle yoga practice, breath, meditation and drawing with sumi ink to still our minds and cultivate sensitivity and spaciousness within our being. We'll explore different drawing techniques that engage with sumi ink's fluid properties that respond to breath, water, rhythm and language of movement. In particular we'll learn about "suminagashi", a traditional Japanese technique where ink drawings are made floating on water. This method was used to create the "cell structures" installation by Tania Love at The Big Stretch Yoga Centre. Sumi ink is a beautiful rich ink made by collecting soot from the burning of sesame oil, grape seed oil, pine wood or other natural substances. Absolutely no experience is necessary. Materials are included in the workshop fee. Sunday, November 4th, 2:00 - 4:30 pm, $50 + HST or bring a friend for $90 + HST. Pre-registration is required so that we can pick up your art supplies. 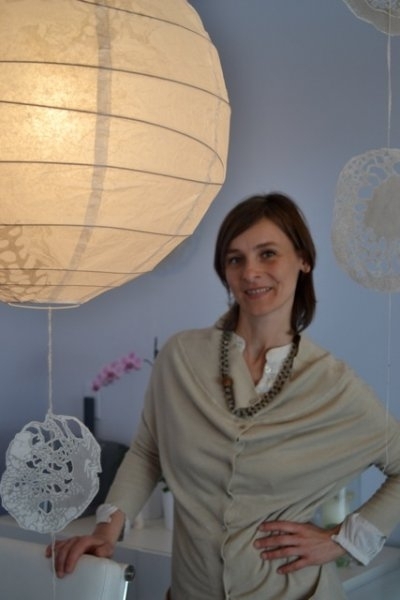 Tania has been teaching yoga and working as a visual artist for over a decade. 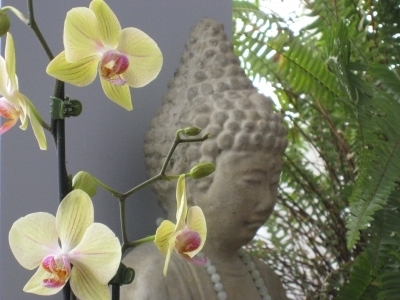 While giving guidance to deepen the practice she opens a quiet space for personal reflection. "Art teaches us how to see aspects of divinity in the world around us, while yoga teaches us how to use the world around us to return to our source. Art teaches that there is truth in each moment of existence. Yoga teaches that through truth ultimate existence can be experienced. Art creates and nourishes, while yoga nourishes and releases." ~ Sharon Gannon and David Life. Enjoy a gentle, candlelit yoga class lead by Joanne Lowe and accompanied by Nada Yogi Ram Vakkalanka. Ram is also a Kirtan leader, Yoga philosopher and Sanskrit expert. 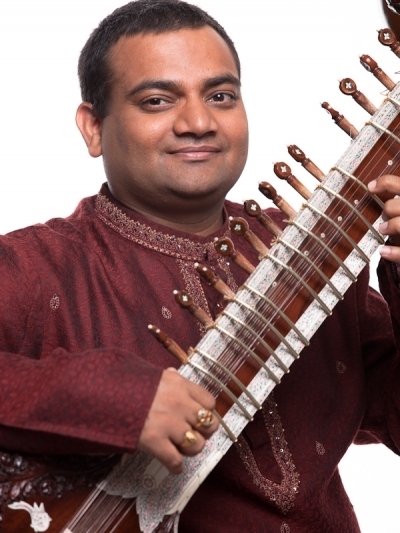 Ram was introduced to Sitar in his teens and studied the instrument for seven years in India. Later, he came under the tutelage of Prof. Shambhu Das, a senior disciple of the world renowned Sitar Maestro Ravi Shankar, and received advanced training in Sitar for six more years. Ram's spiritual Guru - Sri Ganapati Sachchidananda Swamiji - inititated him into the ancient art of Raga Ragini Vidya and using Vibrations for healing purposes. For a video of Ram explaining the art and science of Nada Yoga, visit http://www.youtube.com/watch?v=p6IzY0P7I1Y. To find out more about Ram or see sample videos of his concerts, please visit his website at www.aksharayoga.com. Friday, October 26th, 6:30 - 8:00 pm, $30. Pre-registration is required to reserve your space for this lovely evening. Join Cathy Keenan, Certified Acupuncture Practitioner and Yoga Instructor for this Autumn Yin Yoga Workshop on Sunday, October 14th from 1:00 to 3:00 pm. $30 (includes HST). According to Chinese Medicine there are 5 elements that are fundamental to the cycles of nature and are reflected in the cycles of our bodies. We all have the 5 elements within us arranged slightly differently. The elements are Wood, Fire, Earth, Metal and Water. 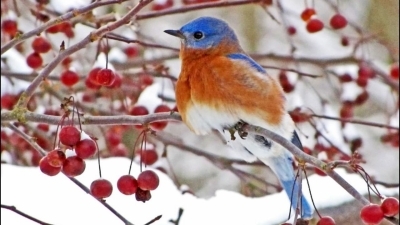 Each element is associated with its own particular season, emotion, and organ system. Metal correlates with Autumn and the Lungs (and Large Intestine). Its power is balance and its virtue is justice. In this two hour Yin yoga class we will explore postures designed to help us target and open the Lungs and Large Intestine meridians to help our systems adjust to the change in season. Autumn is all about transformation. This practice is about embodying our experiences and connecting to what is deep inside and like the leaves on the trees being okay with letting go. About Yin Yoga: This is a slow, deep practice that increases your flexibility by stretching and stimulating the connective tissue of the hips and spine rather than the muscles. This is a deeply relaxing and rejuvenating form of yoga where the poses are held longer. Yin Yoga is a great compliment to the more active Yang (Vinyasa) styles of yoga and is beneficial for any level of student including athletes. This quiet and contemplative yoga helps prepares the student for deeper meditation practice. Please register in advance, $30 (includes HST). Join me for a special class, where we will practice lots of twists and explore variations to twist poses that you can bring to your regular group drop-in yoga classes. This workshop focuses on the benefits of twists - deeply soothing movements to keep the spine supple and strong. Yoga twists have a soaking and squeezing impact, the body's organs are compressed during a twist, this pushes out toxins, as the twist is released fresh blood flows in. This is why twists are seen as detoxing and cleansing both for the mind and body. This Yoga Workshop will consist of varied asanas, including seated, supine and standing twists (plus some inversions with gentle twists). Twists like forward bends, are soothing for the mind, body and heart, releasing mental and emotional blocks. Powerful and transformative and essential to our Yoga practice. The workshop is suitable to many. Friday, October 5th, 6:30 - 8:00 pm, $20 (includes tax). Pre-registration required. Yea, let's twist again, twistin' time is here"
Wednesday nights, 4 weeks, 6:00 - 7:30 pm - $85. 14 consecutive days to a revitalized and refreshed you! Cultivate a flexible body, a deep breath, a calm manner and an unfurrowed brow. Sadhana is a sanskrit term which means conscious spiritual practice or quest. This yoga practice, lead by certified instructor Joanne Lowe, is for 14 consecutive days, 6:45 - 7:45 am. Practice yoga the way it was meant to be practiced, on a daily basis. Salute the Sun each morning with a flowing series of postures and breathwork that will refresh and rebalance the inner you, rejuvenate and strengthen the outer you. Suitable for all levels. Missed classes are not transferable or refundable. Pre-registration with payment required, $200.00. Join us for a little luxury, Wednesday mornings in May from 9:30 - 11:00 am for Restorative Yoga. Gentle, supported postures help to restore movement and flexibility to your body. Assisted by the use of props such as the wall, a bolster or folded blankets, poses are held for longer periods of time, allowing you to let go of long-held tensions that manifest both physically and mentally. Pre-registration is required for this 4 week series. $85 (includes the tax). Sadhana is a sanskrit term which means conscious spiritual practice or quest. This yoga practice, lead by certified instructor Joanne Lowe, is for 14 consecutive days, 6:45 - 7:45 am. Practice yoga the way it was meant to be practiced, on a daily basis. Salute the Sun each morning with a flowing series of postures and breathwork that will refresh and rebalance the inner you, rejuvenate and strengthen the outer you. Join us for our fifth annual candlelight yoga class on Saturday, March 31st from 8:30 - 9:30 pm, $20. 100% of class fees go directly to the World Wildlife Fund. On Saturday, March 31st, 2012, 8:30 - 9:30 pm, cities across Canada, and around the world will turn off their lights for Earth Hour, a WWF event to raise awareness about climate change and symbolize that, working together the people of the world can make a difference in the fight against climate change. In support of Earth Hour and WWF, turn off your lights for an hour and/or join me at candlelit yoga class. The Big Stretch will donate 100% of class fees entirely to the WWF (pre-paid classes are not accepted for this fundraiser). Please reserve your space in advance with payment. 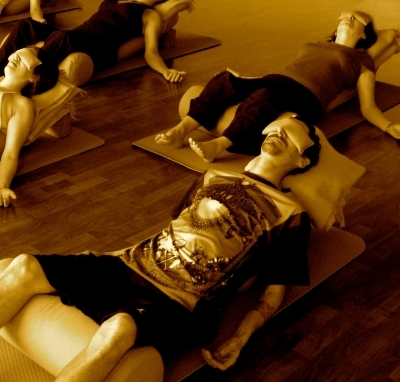 Candlelight Restorative Yoga in February - SOLD OUT!!! Next session runs in April. We'll explore different drawing techniques that engage with sumi ink's fluid properties that respond to breath, water, rhythm and language of movement. In particular we'll learn about "suminagashi", a traditional Japanese technique where ink drawings are made floating on water. This method was used to create the "cell structures" installation by Tania Love at The Big Stretch Yoga Centre. Absolutely no experience is necessary. Materials are included in the workshop fee. 2:00 - 4:30 pm, $45 + HST. Enjoy a gentle yoga class led by Joanne Lowe, held by candlelight and accompanied by performance artist and healer Debbie Danbrook. 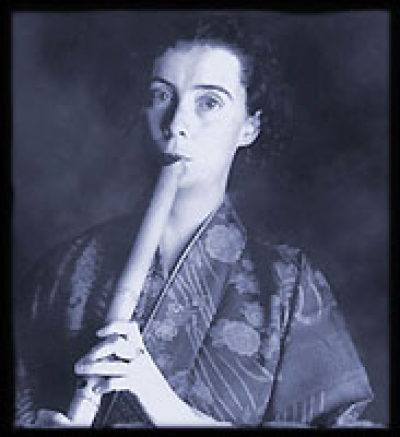 Ms. Danbrook is the first woman to have mastered the difficult Shakuhachi flute. She studied in Japan for several years with a Master Player. Debbie has released 17 CD's of Healing Music, 14 of them specifically for meditation and energy healing. Debbie offers meditations, Healing Sessions, concerts and workshops throughout North America and Japan. She teaches Shakuhachi and meditation in Toronto, Ottawa and Guelph. Debbie also takes small groups to Japan for music meditations at her favourite temples. The flute that she plays, the Shakuhachi, is an ancient Japanese bamboo flute traditionally played by monks as a type of Zen. This Zen practice is called 'Suizen' or blowing Zen. 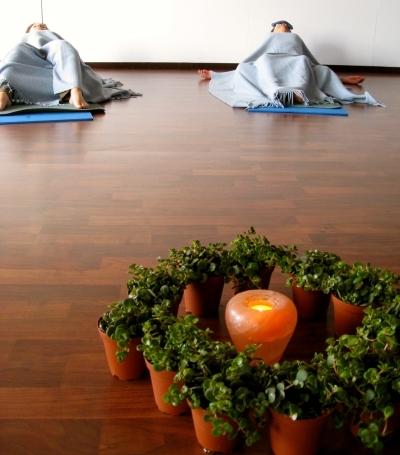 During our yoga class we will focus on our breath and the healing music to help calm and still our minds. The Shakuhachi is also a wonderful tool for transmitting healing energy. The sound helps to clear and balance the energy field of both player and listener. During our yoga class, Debbie will also be singing and playing some other instruments including her North American flute and a small Finnish hand harp called a Kantele. 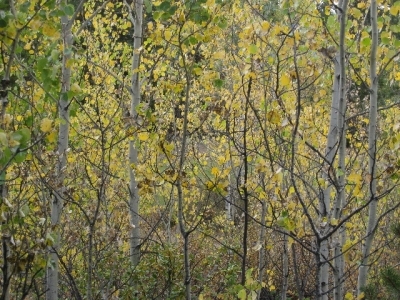 7:00 - 8:30 pm, Friday, October 21st, 2011, $30 + HST. Space is limited, please pre-register with payment early to reserve your space for this magical evening. During this weekend you will either begin or deepen your practice of Yoga with asana, pranayama and meditation classes daily. Free time to swim in the lake, read, enjoy an old-fashioned bonfire, reconnect with nature on a hike or just lay back, relax and enjoy the views will complement this time of learning, healing, inspiration and rejuvenation. Bring along your bike or your running shoes if you'd like. Legendary vegetarian meals (spa cuisine) will be prepared for you by renowned and published Chef Nicola Lawrence. Meals are prepared from herbs and vegetables from Harmony Dawn's gardens. Friday, July 29th at 4:00 pm , until Sunday, July 31st at 4:00 pm. $400.00 + HST per person, shared occupancy. Includes 6 fabulous meals, 4 yoga classes, a deep relaxation class, a guided hike and meditation. Register early to avoid disappointment - space is limited. Join us for our fourth annual candlelight yoga class on Saturday, March 26th from 8:30 - 9:30 pm, $20. 100% of class fees go directly to the World Wildlife Fund. On Saturday, March 26th, 2011, 8:30 - 9:30 pm, cities across Canada, and around the world will turn off their lights for Earth Hour, a WWF event to raise awareness about climate change and symbolize that, working together the people of the world can make a difference in the fight against climate change. In support of Earth Hour and WWF, turn off your lights for an hour and/or join me at candlelit yoga class. The Big Stretch will donate 100% of class fees entirely to the WWF (pre-paid classes are not accepted for this fundraiser). Please reserve your space in advance with payment. THANKS! We raised $700.00++ at our benefit class for Japan. 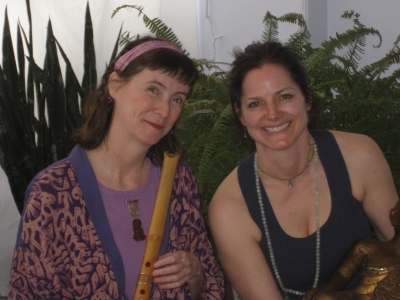 Join Joanne Lowe for a gentle yoga class accompanied by performance artist Debbie Danbrook and her Shakuhachi Flute. 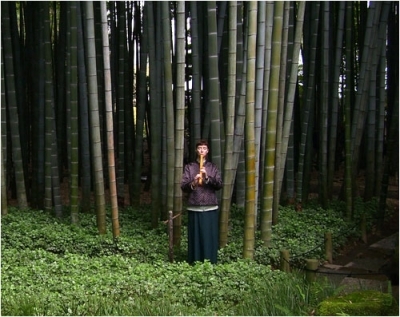 Ms. Danbrook is the first woman to have mastered the difficult Shakuhachi flute. She studied in Japan for several years with a Master Player. Debbie, a former resident of Japan, will be traveling there in a couple of weeks to perform at a benefit concert in Nagoya. Please reserve your space in advance. 100% of class fees will be donated to relief efforts in Japan. This essential four week series, suitable for all levels, is offered on Wednesday nights, 6 - 7:30 pm, January 19th to February 9th. $85, pre-registration is required. Through physical practice (asana), pranayama (breathing practices) and meditation, learn about the effect that your breathing has on your nervous system and your yoga practice. We'll look at the introspective nature of forward bends and the energizing and uplifting aspect of back bends. We'll talk about safe practice and how to prepare for both. Focus will be on standing and balancing poses from both physical (alignment and grounding) and psychological (awareness, attitude, mood) points of view. Sometimes we need a practice that is gentle, restful and nurturing. 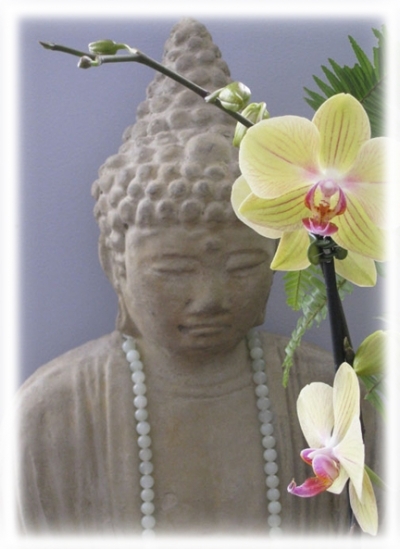 This class will begin with a gentle Hatha practice and end with Yoga Nidra. Yoga Nidra induces a deeply relaxed, yet alert, state that is profoundly transformative and healing. Shelly received her yoga teacher's certification from Esther Myer's Yoga Studio in 2003. In her classes yoga is approached therapeutically, with the objective being to restore balance; flexibility, agility and strength to the physical body, fullness and fluidity to the breath and quiet to the mind. Shelly believes that there is a yoga practice for everyone throughout the different stages of life; young or old, physically fit or not, through good health and illness, yoga can be modified and adapted to suit the individual. In her approach to teaching, she pays special attention to the needs of each person and encourages them to make the practice their own. The drawing practice will include quick gestural drawing to free movement followed by slower observation and expression. The approach includes practicing postures individually to feel them internally and then we'll observe and discuss the physical structure, internal and external lines and expression of form. 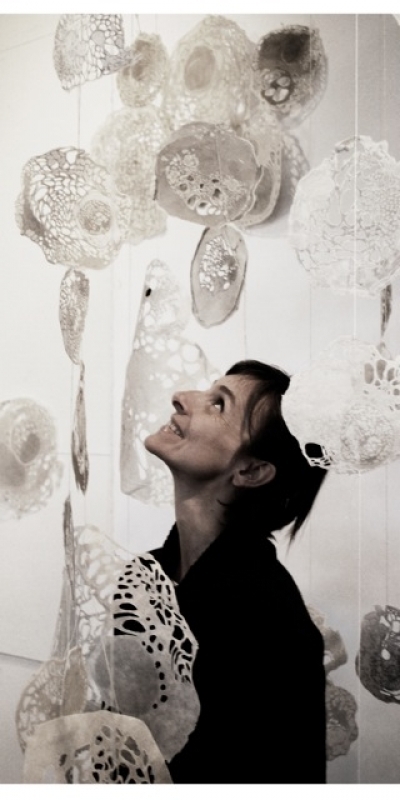 Tania is depicted here with her cut paper installation of cellular like forms. 7:00 - 8:30 pm, Friday October 22nd, $30 + HST. Space is limited, please pre-register with payment early to reserve your space for this magical evening. Wednesday nights, 4 weeks, 6:00 - 7:30 pm - $80. Treat yourself to an Urban Yoga Retreat, right here in your own neighbourhood at The Big Stretch Yoga Centre - no long drives or packing for overnight stays. Our mini yoga retreat will include hatha yoga, meditation, mantra, breathwork, restorative yoga and close with refreshments, treats and surprises. Space is limited - please reserve in advance with your payment. Bring along a flower - one long single stem with a blossom to be added to our communal bouquet. 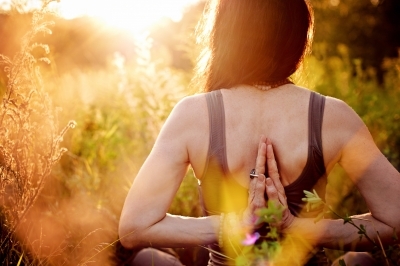 Yoga and meditation can be powerful tools for helping to manage anxiety and stress. Learn simple postures to help relieve the tension that accumulates in your body, as well as breathing and meditation techniques to help soothe your nervous system. Bring a notebook so you can record the practices. All levels, including new students are welcome. 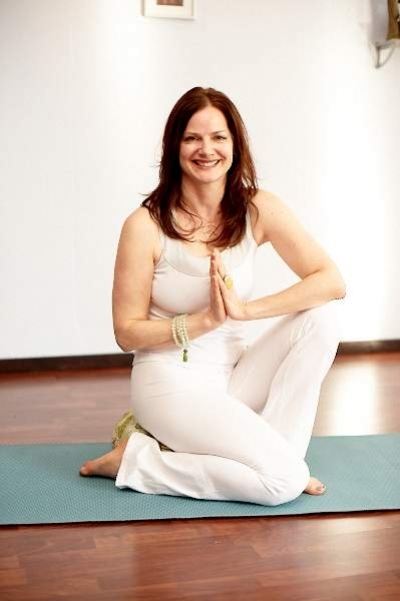 Shelly Rowen, owner and director of Lila Yoga Studio on Roncesvalles in the west end of Toronto, has been practicing yoga for many years and received her advanced teacher's certification from Esther Myer's Studio in 2003. In her approach to teaching, she pays special attention to the needs of each individual and encourages students to make the practice their own. April 18, 2010 - 3:00 - 5:00 pm. Buddha said: "With your thoughts, you create the world." Join Stephen for three meditation classes where you will learn simple techniques of walking and sitting meditation, plus, a broader understanding of the effect our thoughts and corresponding emotions have on sustaining our connection to Joy, Love and Appreciation of All That Is. Their effect on our daily lives will also be discussed at each class. Meditation is also the path to Inner Stillness where we can experience our true state of JOY, LOVE AND EASE. Meditation is a process that the Buddha taught 2,600 years ago. Meditation was designed to bring awareness to our thoughts and emotions and how they effect our current reality. 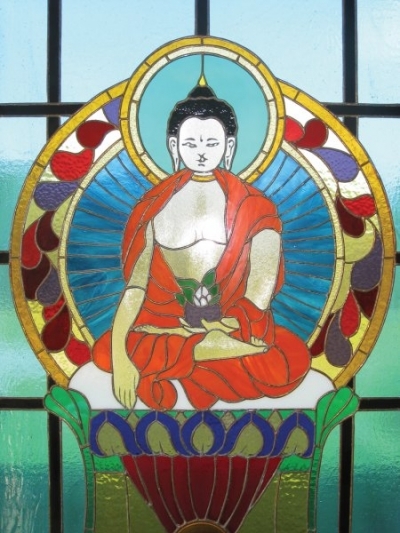 Stephen has been on many meditation retreats and for the past ten years has been practising Insight Meditation (mindfulness) as taught by the Buddha, from the Theravada tradition. He currently is investigating the "Teachings of Abraham" as taught by Esther and Jerry Hicks. He has worked since 1989 as a reflexologist and has been meditating for the past 25 years. Stephen also has background in other forms of meditation and body work, such as, Shiatsu, Reiki and Yoga and has been teaching meditation for the past 15 years. Sunday, April 11th, 1:00 - 3:00 pm. Investment: $30.00. Advance registration required. The Mala, a string of 108 beads crafted of wood, stone, crystal or rudrasksha seed, was conceived of in the Buddhist and Hindu traditions as a meditation aid, designed to act as an anchor that combats the mind's natural tendency to wander. In week one, you will create your own japa mala (materials provided) - lovingly created with your own blessings or kind words. As each bead is strung, you may chant your own blessing and each time you meditate with the aid of the mala beads, you imbue it with your devotion, your love and your hopes. 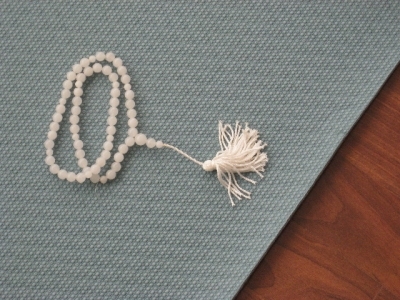 When your mala becomes an integral part of your meditation practice, simply touching it will still the soul and quiet the mind, preparing you to slip easily into a transcendent state. In weeks two and three you will utitilize your new mala within your yoga practice of meditation and asana. Pre-register for 3 week series on Wednesday nights beginning April 7, 6:30 - 8:00 pm, $100. Pack up your toques, sweaters, snow pants and long johns and join us for a fabulous winter retreat at Harmony Dawn in Rice Lake, Ontario. During this weekend you will either begin or deepen your practice of Yoga with asana, pranayama and meditation classes daily. Legendary vegetarian meals by renowned and published chef Nicola Lawrence, curling up by the fire with a good book, reconnecting with nature or just laying back, relaxing and enjoying the views will complement this time of learning, healing and rejuvenation. 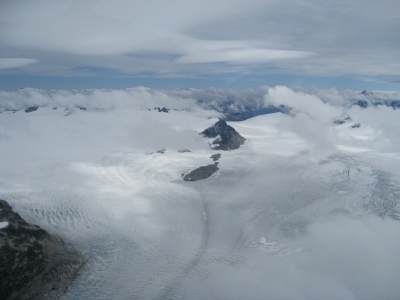 Build a snow god or goddess, enjoy snow-shoeing or cross country skiing in this beautiful winter wonderland. $400.00 + GST includes 6 fabulous meals, 4 yoga classes, a deep relaxation class, a guided hike and meditation. Contact Joanne for schedule, map and registration form. We invite you to participate in a Fundraiser benefiting the recovery, relief and rebuilding efforts in Haiti.� Come share yourself and your energy- mind, body, and soul - as we support Haiti and send our love, light and prayers to all her people with a lovely yoga class by candlelight - all levels welcome. The world is responding to the disaster in Haiti, and people around the world are coming together to help in any way they can. When we join together, amazing things can happen. 100% of your class fee will be donated to the Haiti earthquake relief effort. $20 advance registration required to reserve your spot for this candlelight yoga class on Friday, January 29th from 6 - 7:30 pm. Our postures take us deeper than we think. Journey though the body - mind - spirit connection, starting where we are at, here in our bodies. Take a deep look at what your yoga practice is really doing for you - there is a balance of body, mind and spirit that happens naturally throughout the practice of yoga. In this 4 week series lead by Cathy Mines, Certified Yoga Instructor and Psychotherapist, we will examine and better understand the subtle and not so subtle sensations in the body, observe the awarenesses that arise in our practice and set a plan to connect these benefits off of our mats and into our daily lives. Wednesday nights, 6:30 - 8:00 pm, January 13 - February 3rd, 2010, $80. Advanced registration required. Cathy Mines describes herself as a perpetual student of yoga, constantly collecting skills and knowledge. Building her own approach to wellness, allowing the people she surrounds herself with to inspire her and shape the heart of her teaching style. Cathy's lifestyle advice "involve yourself, be receptive, awaken your full potential and always be ready to greet a stranger with kindness." Suitable for all levels. Missed classes are not transferable or refundable. Pre-registration required by January 11th, 2010. $200.00.